* Any image posted by me in any thread is generally used without permission and will be removed or credited to the artist and/or its owner at their sole (simple/single) discretion. No disrespect is intended. If I used your image, it's because I felt that it represented the feel of what I was statting. Jason Prince Wonder Woman's "Twin Brother." Emerald Flame a Legacy Character inspired by my JLAcademy game by Emerald Flame. Last edited by Bladewind on Wed Apr 03, 2019 3:16 am, edited 140 times in total. Last edited by Bladewind on Mon Feb 11, 2019 2:05 am, edited 33 times in total. 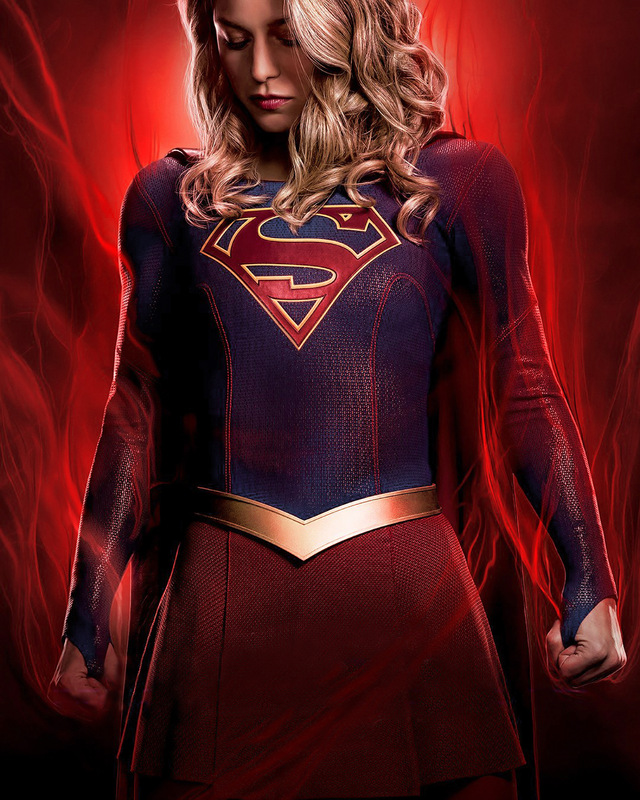 Power Loss: Supergirl loses her powers and her Str/ Sta are reduced to 1/ 2 under a red sun, like that of Krypton, and other effects draining or interfering with the energies of the yellow sun can deprive her of her powers. Responsibility: Supergirl feels a strong sense of responsibility to use her powers for the benefit of all. 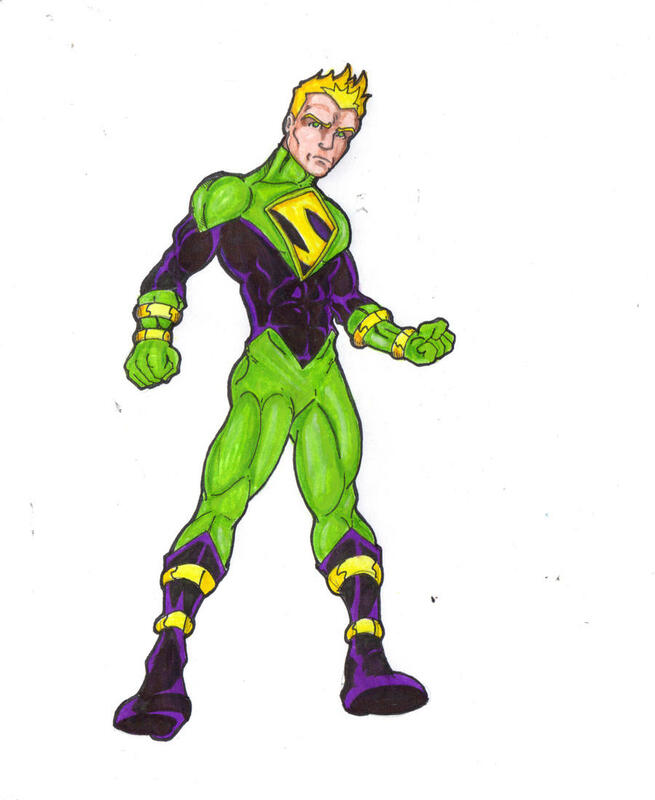 Weakness: Green Kryptonite...Its radiation saps the Strength and powers of Kryptonians, leaving them impaired, disabled, and eventually debilitated in terms of Strength and power effects. Long-term exposure (usually a matter of minutes, less for a large enough amount) imposes the dying condition and may lead to death. Vulnerability: Other forms of Kryptonite can have other effects on her, depending on the GM. A form of Red K, for instance, removed her inhibitions and made her decidedly... mean. Identity - It's not common knowledge, at least not yet, but Kara Danvers does not exist in or world. Melissa Benoist suffers from MGS, and has essentially become Supergirl… as a result, "Kara" actually has a secret identity and is literally hiding in plain sight. No vulnerability to magic on this build. Its ill defined in the comics, and not canon on the show yet so I dropped it. Basis of Starguard's Supergirl, but stronger, "less" attractive (more girl next door, adorkable than jaw dropping hottie.) He ha a lot of ranged effects on his vision powers that I dropped and reallocated. The DEO and her Hank Henshaw did not merge. Alex did, and she is currently working with Coulson. Explaining Kara's Connections. She has used her Super Breath on more than one occasion in the show, and so I put it in. I have opted for an Improved Init of 2, and Seize Init to give Flash his niche, and to have that fallback where she can just be first and that's that. 2017/01/17 - Tweaked Super Strength and Super Stamina - her baseline on both of those is now 1. 2017/012/21 With 5 XP, Made Flight and Speed dynamic, (giving her access to Quickness while Flying for instance) adding Massive Knockback to the Flight Array and putting 4 ranks of Regen to represent Fast Healing. Also added a Feature to her cape - used the mechanic for a Dimensional Pocket from Dimension Powers, which essentially gives a Bag of Holding with 100 lbs of space. I will explain that as using Phantom Zone tech on a small scale. 2018/08/31 Made an update, giving her a few XP/ PP after the last story, I've added Holding Back/ Solar Flare to the character. The Complication added as a result is directly linked to that advantage. I find it doubly appropriate for this version of Supergirl as she really doesn't know her own strength. "When I was a child, my planet, Krypton, was dying. I was sent to Earth to protect my cousin. But my pod got knocked off course and by the time I got here, my cousin had already grown up and become Superman. "And so I hid my powers until recently, when an accident forced me to reveal myself to the world. To most people, I'm an assistant at CatCo Worldwide Media. But in secret, I worked with my adopted sister and the DEO to protect my city from alien life and anyone else that means to cause it harm. "Now, with others wearing the family crest, I have bided my time in another role, learning about this world where your fiction was my reality and that of so many others. I have found kindred spirits to the DEO in Homeland Security and with Agent Coulson and his team. And thankfully I have Alex at my side. "I will protect this world from alien life and anyone else that means to cause it harm as I would my own adopted world. Well, that's what she tells people. The truth of the matter is that while Alex Danvers "crossed over," Kara Danvers did not. Instead, Melissa Benoist suffers from one of the most severe cases of Merge Gestalt Syndrome known to exist to Homeland Security. As a result, she'd not truly as powerful as the character that she portrays on the TV show. Most of her knowledge of said character comes from comics, the scripts she has read and the show bible that she has memorized. This development has been problematic for her for all of the obvious reasons, not to mention having to deal with a duplicate of one of her close friends who essentially mourns the loss of a sister that Melissa now embodies. And although it's tough for Melissa and Alex, the two are becoming close as Melissa tries to help Alex cope and Alex in turn helps Melissa cope with her powers. I did not "just" add powers or increase existing one, I also added to some skill with her powers and defenses as well as some advantages that make her more "badass." The primary reason that I think this fits this character is simply because this is an actress waking up with the powers of the character she portrays - she has no training, no experience and I think she would be somewhat afraid of the damage that she could cause as a result. Last edited by Bladewind on Mon Nov 12, 2018 4:43 am, edited 15 times in total. Motiviation: Responsibility - with great power... Yeah Right ! Do you have any clue what a thrill jumping off buildings with nothing to stop you but a thin stream of liquid that turns to a string on contact with air? Hell yes ! 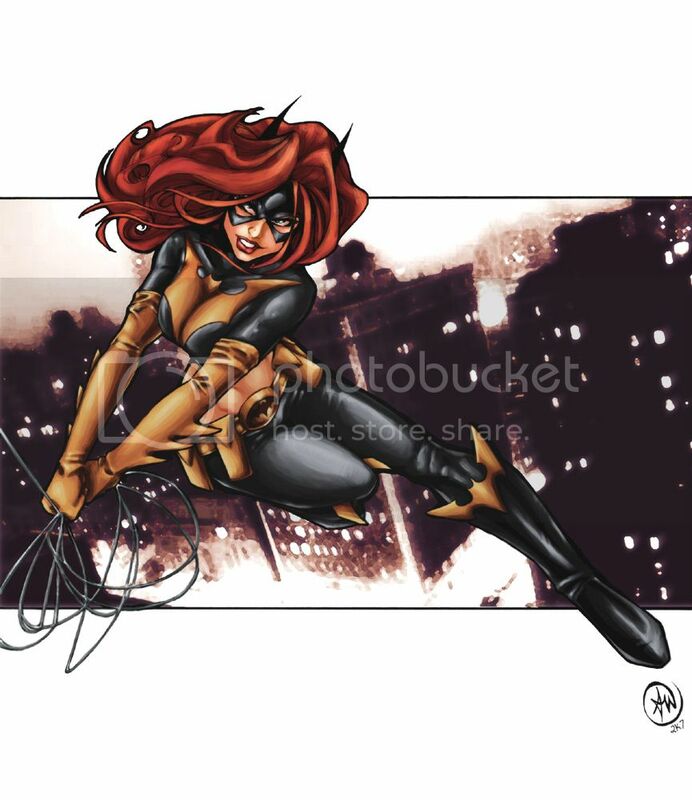 Identity: Thrillkiller Batgirl - Partly on purpose, partly by chance, Nightwing's current costume is based on an Elseworld`s Batgirl with just a slightly darker tone. She uses this to her advantage on occasion. She considered the Spider Gwen costume when she got here, but ran into Peter Parker and thought that would be tactless. In the mid-nineties, the Justice League and the Avengers were at odds. Members from each team had defected to the other and it was among the first times that Batman and Captain America agreed directly. They`d worked together before, but each had issues with the other`s style and methods. But Captain America and Batman both stood against the government this time, right alongside the Man of Steel. They were at odds with friends like Iron Man, the Flash, the Atom, Spiderman… The Registratrion Act had truly divided heroes. During that paranoia, SHIELD deployed Spider Woman to Gotham to gather secrets and information on the Bat Family. Knowing full well that Batman would not trust her, Fury had sent Drew in more as a smokescreen and diversion than anything else. But during the intrigue and the drama something unexpected happened… Red Robin and Spider Woman started a relationship! In 2012, the latest incarnation of the Batman had a new partner. Named Robyn originally in jest, she chose the name of Nightwing and quickly made a name for herself. Now, a new world, new challenges... Some of the big brains are trying to determine if there's a way to fix things. In the meantime, Robyn is working to defend those that are here. Fades on Webbing Over the Eyes and Oh Shut Up is meant to represent that the web evaporates a bit every round, even if the target continues to be afflicted. Note, the webs are not devices and that I moved Swinging from EP to PP. Last edited by Bladewind on Mon Sep 17, 2018 1:56 am, edited 3 times in total. Enemies - Darkseid, the Female Furies, Granny Goodness. Note, that Barda's Darkseid was destroyed. Mother Box - The Mother Box has a mind of its own and decides who it wants to work for and when. Freedom is the Right of All Sentient Beings - Okay, he overheard that from Optimus Prime... but he believes in Freedom and fights for it, both his own and that of others. I have to say, part of me screams too much for one character, the other is intrigued. I took the DCA Barda build and modified it, then took the basis of Mr Miracle and did the same. The Lantern Powers are mostly my own take. I much prefer the Mother Box as a device. Thanks for the push there Nelphine. Given that this is a two-for-one character, note that they share a Hero Point pool, although they can both earn HP for said pool. I contemplated a simple sidekick advantage instead of summon, with mental link. Cost wise, it would be the same. The only advantage would be that I could give Scott 5 PP by spending 1 PP on Sidekick as opposed to 13 points as written. I am keeping that idea in the background for now. If I went that route, I would indicate that I could spend a maximum of 1 point on Scott in this manner for every 5 PP earned, forcing 4 out of 5 points to go towards Barda. Last edited by Bladewind on Mon Nov 07, 2016 12:18 pm, edited 3 times in total. My name is Joel Kent, but these days I`m better known as Superboy. Although not something I am necessarily proud of, I was born to Ultraman and Superwoman on a parallel Earth where almost all those you know as heroes are villains and most of those you know as villains are heroes... As I said, I am not proud of my lineage but I will not hide from it. It is my duty to protect those that I can from the Syndicate and I will not shy away if people know who I am. When I was still in my mother`s womb, Owlman exposed her to Gold Kryptonite, effectively robbing me of my Kryptonian heritage. Facing a life as the unpowered son of Ultraman was not one that my mother wished upon me, and in an uncharacteristically kind moment, she arranged for it to appear that I was stillborn and secretly saw to it that I would be delivered to the one person who had a chance of protecting me and seeing me grow to adulthood… Lex Luthor. Lex saw to it that I grew up knowing who my real parents were, and to always be wary of the Syndicate as it was unlikely that my mother would show me kindness again, and a certainty that my father would attempt to destroy me. Lex saw to it that I kept the name that Superwoman wanted me to have, Joel, as a sort of homage to my homeworld. I chose to keep the surname of Kent as a reminder of what I could have been. 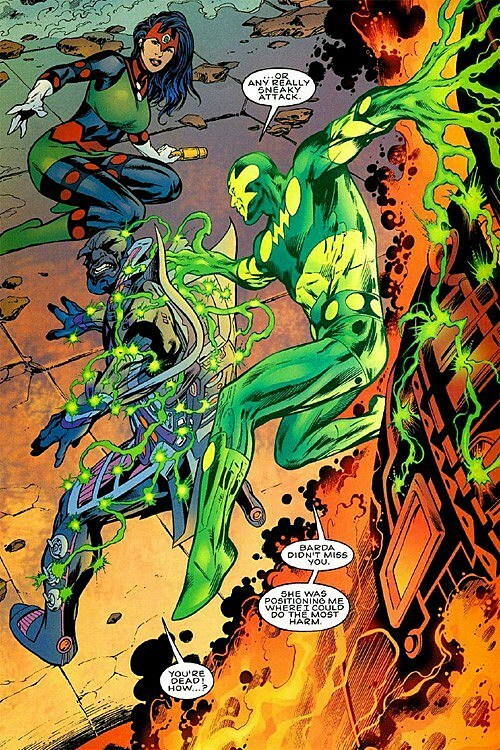 Being powerless, Lex devised a suit for me that gave me powers that put me on par with the rest of his team and made me a potential threat to those in the Syndicate. With dimension spanning and teleportation based powers, I took the name Superboy and the colors of Luthor`s own battle armor as we formed the Justice Underground. Now, knowing that there is in fact a multiverse out there, I have joined with the Barry Allen of another universe to become both myth and legend, to safeguard the timestreams from an aberration that we have yet to identify but whose effects we have already countered. On board the Goldstar and with the AI Skeets, I am working with Captain Atom, Catwoman, Booster Gold and guided by the Flash, we will protect the multiverse and I will free my world from the control of the Syndicate. Red Stellar Wavelengths – The suit operates on the energy spectrum akin to that of a Red Sun. As such, it dampens Kryptonian powers including his own. Once a Luthor – His colors and allegiance are heroic on his world, but aligned with Luthor almost everywhere else. Responsibility: Superboy feels a strong sense of responsibility to use his powers for the benefit of all. Superboy is my character in a tabletop game based loosely on the Legends of Tomorrow TV show`s premise. We call it Myths and Legends. This is a Supernova costume, minus the shrinking/ mass control powers. The character concept is an alternate reality Crime Syndicate version of Superman/Batman Generations. Wherein the Ultra Humanite in Lex Luthor`s body attempted to rob Superman of his powers via Gold Krytponite but instead robbed them from Superman`s unborn son, in his world Lois Lane was exposed to Gold K by Thomas Wayne, the Owlman. He would be taken in by Lex Luthor and raised to be part of the Justice Underground. I've given the GM a possible hook that without the costume, which generates an energy signature similar to that of a red sun, that the effects of Joel`s exposure to Gold K were reversed.. and that he actually has Kryptonian powers. Either way, Joel almost always wears his suit and would be unaware of this development. Last edited by Bladewind on Sun Jul 23, 2017 3:31 am, edited 6 times in total. Addiction: Mask loves to use his powers. He craves using them in new ways. Identity: Amnesia: Cannot remember anything about his past including name, "secret origin," family… and even if the form he woke up in his actual gender ! Blending in: Mask actually does not like to be the center of attention or him/herself. He goes out of his way to be someone else. Mostly tweaked from the Operation Pheonix build, I took out most of the skills and advantages. He needs to mimic to hit caps. Limited – He's 32 feet tall. Some places, he just cannot go. This is an attempt to build a Transformer without using multiple or alternate forms. Starscream from the Shattered Glass continuity. I did not give him rank or any skills related to Cybertronian Lore mostly because I think they'd mostly be moot. As much as he might know about a given subject might be just as wrong. However, he does have a +5 to any Knowledge skill check not listed on his sheet. There is no "Primary Power" in the Robot Mode Weapons - There are a total of 5 powers in the Weapons Array (6 with the "Test Missile") and I decided to differentiate between Weapons available in different modes. I was reading a few entries on line, and it seems that SG Starscream has a Test Missile Launcher... One he tests weapons on regularly. I included it, but there is no point cost as it would be either for Inventions or Power Stunts. Last edited by Bladewind on Mon Apr 23, 2018 11:35 pm, edited 4 times in total. "No. I will not wear a Slave Leia costume." Alt: Lightsaber Shield: Create 7 [Movable, Selective; Proportional; Subtle, Quirk - Walls of Force only, Quirk, must keep lightsaber's active and moving]"
Force Presence - Force Users mark their presence by their Force Signature Under certain circumstances this means that the character cannot hide the fact they are in the general area to others sensitive to the Force. 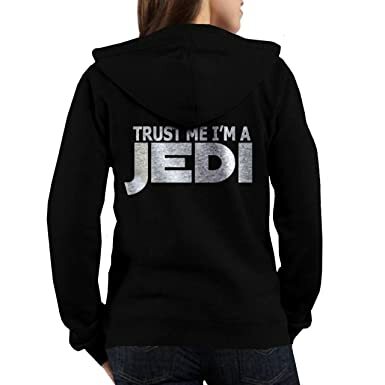 Beware the Dark Side / Jedi Code - Power Attack, All-Out Attack, Dark Side applications of the Force... all of these can grant power in the Form of HP, but the Dark Side is easy, seductive. Overuse will twist the user both physically and morally. Conflicted - Satele is starting to question much of what the order becomes in the future of her world, and has hard choice to make regarding any association she intends to make with Force Users on this world. The rigidity and inflexible nature of the Council by the time of the Empire, the ease with witch Sidious hides in plain sight... She wants to find ways to prevent this from happening. I have Skill Check Required on the Lightsaber and a Skill Bonus of +16 and Skill Mastery, essentially making the check unrequired unless she rolls a natural 1… this is flavor. The cost on this exchange is 6 points for the Skills and Advantage. At first glance it saves about 10 points on the lightsaber for the various places its required, but that`s not accurate as the reduction in return on removable is also reduced. There is more in the Force Array than I wanted, but it makes a certain amount of sense. I made Telepathy and Telekinesis separate Arrays though. 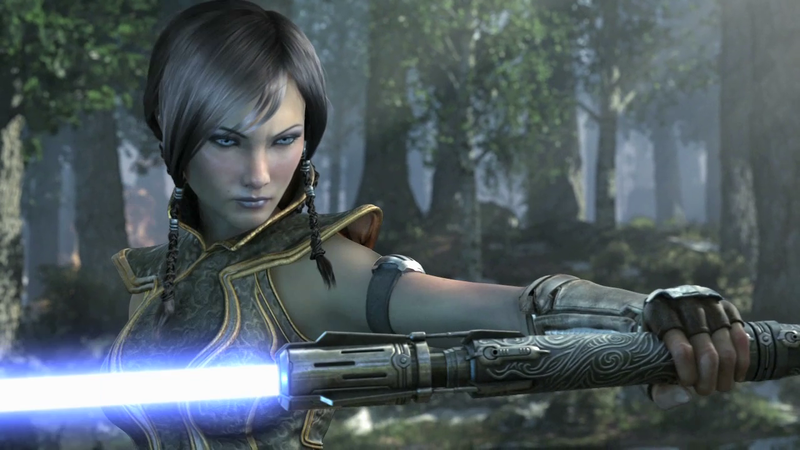 Satele has taken to dressing more casually, and carries an artist tube to conceal her lightsaber. From the personal journal of Satele Shan, Merged Earth. Three months ago I awoke not in the bunk I had taken on board the Redshifter, but on a strange world that I had never heard of, much less seen. It was, you'll pardon the expression, in a galaxy far far away from what I knew. I stayed quiet and tried to gather information at first, trying to learn what had happened. 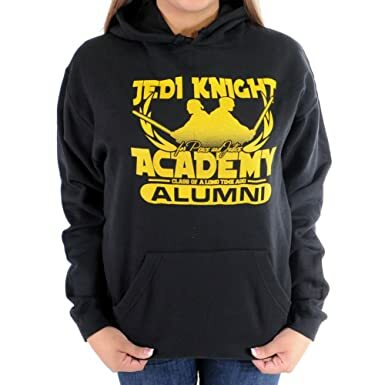 At first I was relieved that many of this strange new world were aware of the Force and the Jedi. I thought that I would be able to contact fellow Jedi, but then I came to understand that the Force to this world was a fiction. That a series of holovids and novels and other entertainment were what my life and those of the other Jedi amounted to in your world. I also discovered "YouTube" and what you envision as my future. It was distressing to watch the events of the attack on Korriban and the death of my master unfold precisely as they had less than a month earlier for me. And the future of what I would become? Grand Master for the discovery of Tython? Would that your maps were more accurate that I could have foreknowledge if ever I was to return home… And then I discovered that other Force Users were also present. I found that many of this world wanted to exploit my ability, that wished to see if they could push me to the Dark Side as it were. I found many replicas of lightsabers, and that my own style was sought after as well. I found myself drawn to help and maintain order in this chaotic new world as I learned more and more about what had happened. I witnessed many claiming to be Jedi and Sith but were mere charlatans – some with real power, others without. A month ago I fell on the trail of what I expected to be another false Force user. But the evidence that I discovered suggested that a lightsaber was involved. The lack of external trauma suggested internal injury from telekinetic application of Force. So I followed the trail, and discovered another from my universe albeit from far in the future of my time. We fought, but his skill was far greater than your fictions would have me believe, and I underestimated him. He bested me in our first battle. However, he did not do so before I was able to free several captives from him. It seems he was seeking out what you call "telepaths" as opposed to Force users with the intention of creating and molding them into acolytes of the Dark Side. One such, as it turns out, would become my padawan on this world. I continued to follow the trail of Opress while being approached by various governments and organizations to serve as protector of this world's people as well as those that had arrived from Elsewhere and Elsewhen. I finally accepted an offer from Agent Kate Spencer, sensing that I could trust her and her intentions over those of many others who were more beholden to their organizations than their ideals. With Spencer's assistance I discovered Opress was not working alone, something that I had expected by this time. With my padawan Elizabeth Braddock, we found Opress' lair and were able to deal a crippling blow to his organization, but his master escaped. But we have a name now, and it's a name not found in your lore. Darth Solon. I will find this Sith Lord. I vow to halt his corruption. Last edited by Bladewind on Sun Jul 23, 2017 3:37 am, edited 3 times in total. Vulnerable: The Lizard is cold-blooded and vulnerable to cold effects, taking an extra degree of failure against cold based attack in addition to suffering fatigued, exhausted, and asleep conditions from cold effects or in cold temperatures. The image got me here... basically she can pull off her skin and then regrow someone else's face. I imagine, for dramatic effect, making it look painful. There is a feature on her Growth allowing her to have full benefit of the growth regardless of actual height - allowing Morph and Growth to work together. The Jackal was not only obsessed with Spiderman, he was sick and deranged on many other levels. The Lizard is proof of that. 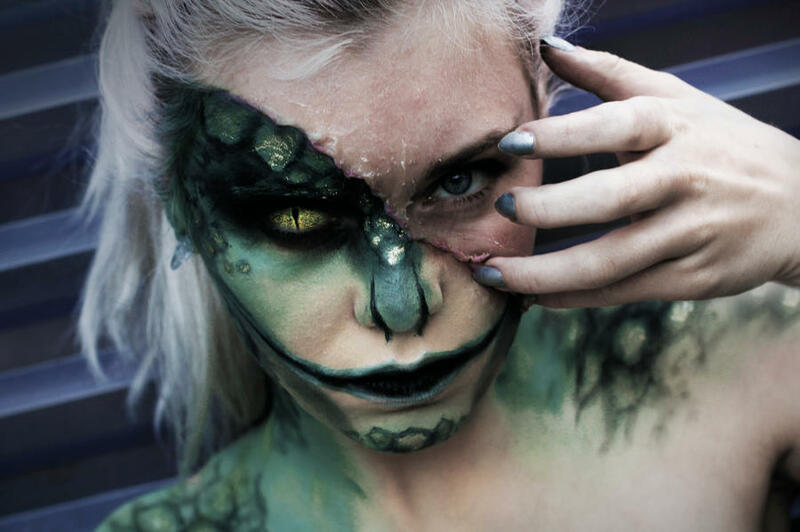 At her base, The Lizard is a clone of Gwen Stacey injected with the DNA of Spiderman, the Lizard and Mystique. Like the Goblin Spider and some of the other "Sinisters" that the Jackal created, the Lizard was in cryosleep until needed. Recently discovered and released by the Web, the Lizard is now looking for her place in society. For the time being she is absorbing information like a sponge, supplementing her own programmed knowledge which puts her somewhere around a third year medical student. Only time will tell if she will succumb to her reptilian side as did her namesake or if she will become more than the some of her parts. Last edited by Bladewind on Sun Jul 23, 2017 3:38 am, edited 1 time in total. 25 point HQ + 5 Alternate HQ "Safe Houses"
Last edited by Bladewind on Mon Apr 23, 2018 11:36 pm, edited 1 time in total. Not quite finished as she's way more combat and power than actual character, but a start. Sandstorm will link more to my original character Scirocco than Sandman, but will fill Sandman`s role. The background and origin will be a mirror of Sandman, but with an Ancient Egyptian twist. * I'm not posting my creation and house rules for TF yet, but it's not really relevant to Puncture anyway. He's a straightforward build and doesn't use the full allotment of points I intend for Autobots and Decepticons. * His Willpower is more stubbornness than traditional Willpower. * This is an empty trailer, the basis that I intend to use for trailers used by various similar characters. * I put Parry not because the trailer can actually parry, but as a an "extra" defense in case it gets targeted - I would have no problem with Puncture's Dodge and the trailer's Parry being used in play... this is not meant to be a PC soldier where it really matters anyway. 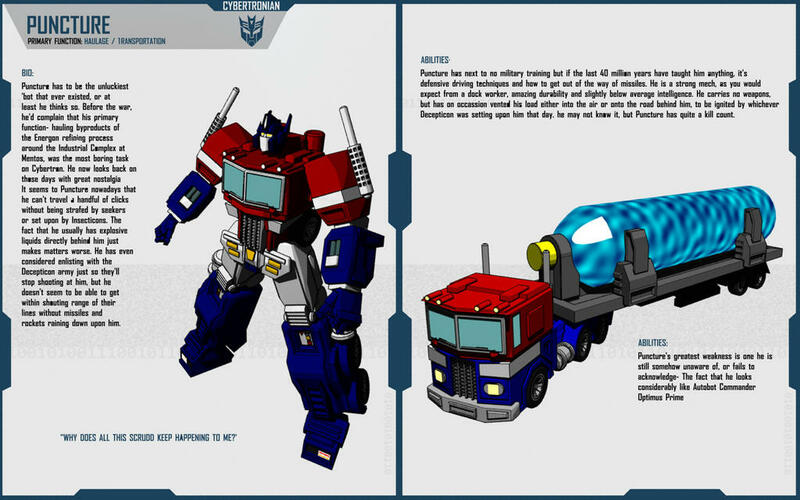 * The trailer is built with the construct rules, something I generally intend to avoid in my TF builds. Last edited by Bladewind on Mon Jan 02, 2017 4:56 pm, edited 1 time in total. Power Loss - Web Shooters: He has the same problem that has plagued Spidey(s)... he can run out of fluid at the most inopportune times. Weakness - In his time as an operative for the Jackal et al, he was programmed with shutdown phrases that certain people have acquired knowledge of. Guilt - He has guilt regarding actions taken while a mercenary under the control of the Jackal. * Really not sure this will fly (sorry for the pun) but... it cost 6 Power Points and gives 5 flight. If I bought Flight, Platform, Removable it would give me an even higher flight score. * As it is, he can command the minion to fly as a move action, as per normal... and can "pull up" to put the Glider in the path of danger if needed. * The variable might be daunting, but all it really does is allow the Dodge and Parry Scores (and if set properly) Advantages like Evasion to come into play. 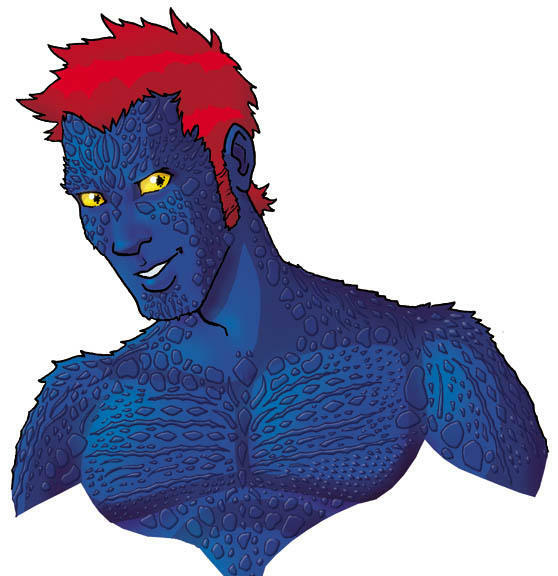 * For those that realize, yes, Gobby is quite similiar to Nightwing, a character I am playing in the Merge. What can I say, I like Spiders... That's one of the reasons I am thinking about a Goblin Glider actually, to move the concept away from Nightwing a little more. * Since it wasn`t clear, the Trap Door powers (named for a Trap Door spider), is essentially Nightcrawler`s teleportation abilities, ripped and renamed from Thorp`s build of Kurt. 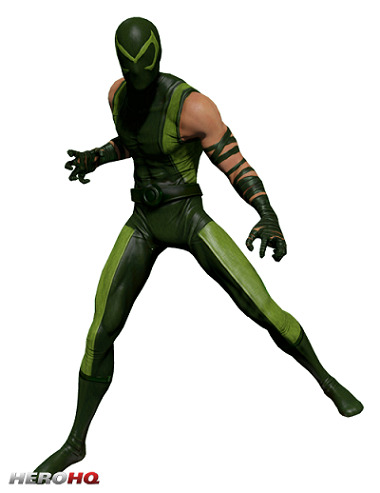 * I could definitely array some of his wall crawling and other spider movement, but didn`t. Considering that he already has Teleport and Move-By Action, the rest of his movement powers are almost descriptor... but keeping them out of an array makes them independant and available if ever the teleportation is neutralized. * Haven't decided on a "real name" yet. Charles Trainer is a male version of Carolyn Trainer (Lady Octopus). Warren Connors is a mashup of Miles Warren and Kurt Connors. I originally wanted to include Connors to have an "in-joke" link to the name Kurt (because of the Nightcrawler powers). Warren Connors is definitley my preference, but Charles Trainer is... simpler. * A benefit akin to alternate identity to create an established identity. Will be more clear once the background is up. 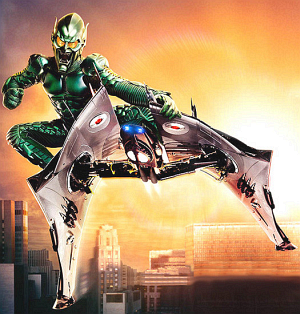 One of the Jackal`s attempts to clone Spiderman was actually a splice with another wall crawler. Although clearly Warren had an obsession with Parker, he choose to clone Kurt Wagner. Or more accurately, splice Wagner`s DNA with Parker's. The result was a success, a super-strong version of Nightcrawler without the physical features that made walking in public difficult for Wagner… The clone was put into cryogenic slumber as Warren saw limited potential for his plans despite the success of the process. Warren destroyed all of his research and notes on The Trapdoor Spider, as he came to call the project, keeping only the prototype clone on ice. From time to time, he did find uses for his creation, conditioning and programming the clone between missions. The one or two times that Spiderman clashed with the Goblin Spider, he believed himself to be fighting the Green Goblin and with his teleportation abilities, the Goblin Spider was able to escape custody, and capture for that matter, several times. The aliases of Warren Connors and Charles Trainer were actually provided by Peter. *credit to Weird Al for that line. Last edited by Bladewind on Sun Jul 23, 2017 3:39 am, edited 2 times in total. 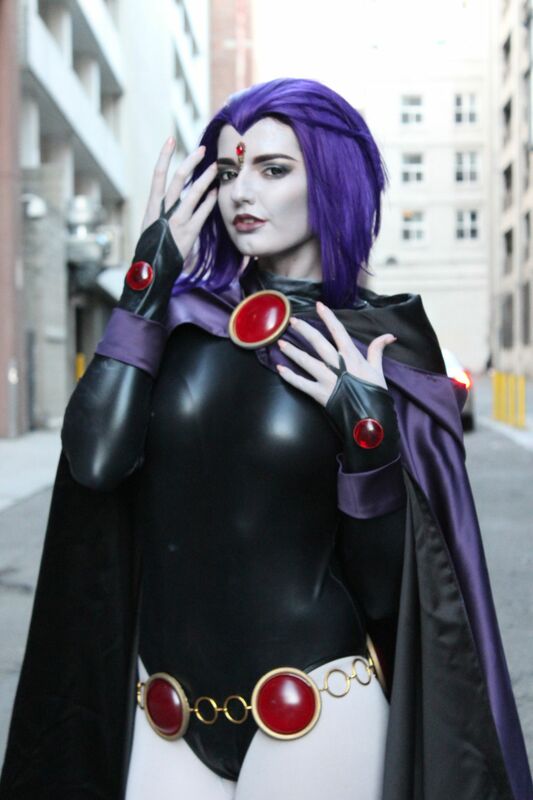 This build is design for my JLA Legacy setting, the daughter of Raven and Gar Logan, and named for her godfather Vic Stone. She is actually an update from a 2nd Ed character I had made once upon a time. The Soul Self is lifted whole cloth from the DCA Raven, and I actually want a different animal for her. There is no real combat ability on this build and that's intentional. Last edited by Bladewind on Sun Jul 23, 2017 3:40 am, edited 1 time in total.